Roller Blinds. UK Online orders from Bay Blinds Limited. Using specially coated light excluding fabric these dim out blinds are available in White, Natural, Green, Blue and Yellow. 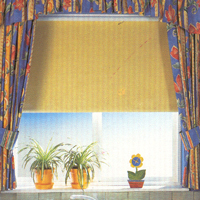 Dim Out Blinds are simple to fit and can be trimmed for recess fitting.